SHORT walk to the beach AND pool. Cleaning fee discounted for weekly stay! Our unit is situated just a short walk from the breathtaking emerald waters of the Gulf of Mexico. Google horizon south and you will get a great view of our units and resort. Clean, comfortable furnishings to relax in after a long day of fun on the beach or golf course or shopping at Pier Park. Just bring your clothes and golf clubs, because here you will find everything you will need at Horizon South to make this a dream beach vacation to remember. 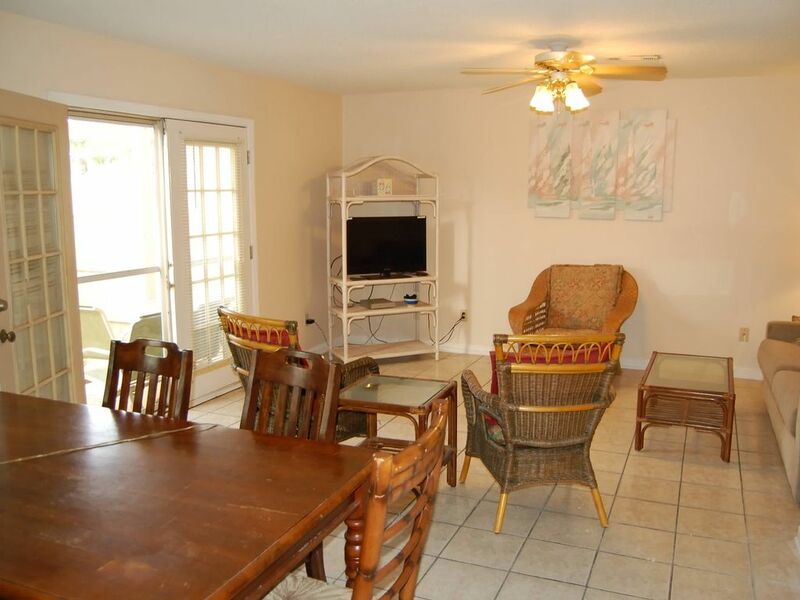 Bright cheery decor with flat screen TVs, DVD (3 - 32'), microwave, dishwasher, and large capacity washer/dryer in unit. Unit has balcony upstairs and patio down with BBQ grill. Complimentary WIFI is included during your stay. Listed rates INCLUDE all taxes. Horizon South Resort charges a $5 per person activity fee that is not included in our rate. You'll love our location in the complex. We are one of the largest units in the resort and are about as close as you can get to the beach. Just a stroll across our parking lot and then across front beach road and you are on the beach. Nearby is the south pool at the front beach road entrance. This is the best of both worlds. If you're here for Frank Brown Park and all the activities there we're less than 2 miles from the park. The Horizon South team does an amazing job keeping the complex looking good, located on the west end of the beach, it is a gated community in a family oriented atmosphere. The complex offers 4 pools, hot tub, miniature golf, shuffle board, 2 tennis courts, basketball court, indoor recreation room with 2 pool tables and fitness center. Note: All rentals are subject to both State and County sales taxes. VRBO will charge you directly for taxes and will be added to your rental when booking through VRBO. Have owned this unit since 2011. Have rented condos since 1995. I purchased here because of the variety of options for entertainment on premises. The property is well maintained, gated, has lots of things for families to do without leaving the property! Close to the beach, amenities of resort, pool on our end of complex. Gated community. Well kept resort. Since it's a townhouse there are no steps to climb to get to the unit. Covered parking right outside the door. 4 Pools, Jacuzzi Spa, Shuffleboard, Basketball, Tennis, Miniature Golf Course. It was a great place to stay, close to everything!! Our family said one of the best vacation yet!! Great place. Clean. So close to wonderful shopping and great places to eat. Will definitely return! Thank you so much for staying with us! Looking forward to having you return next time! Very nice property and the owners was very nice . They worked with me and was very nice . Thanks! We look forward to having you again. We were excited about our stay in what appeared to be a nice condo. Location is awesome and we have stayed in this condo complex before. It has great access to everything! Here are the downfalls: (1) Were given incorrect access code to access the unit. We had to go to the main building and get correct code from the maintenance people after an hour of waiting for Home Away to try and get a hold of owner. (2) The same smelled awful once we got to enter unit. Smelled of cat pee. (2) Dishwasher leaked all over the floor and it smelled of old nasty water. No mop or broom in any of the closets to try and clean it up either. (3) No batteries in the smoke detectors!!! Yikes! (3) Carpet was so dirty and the sheets in one of the bedrooms were NOT clean. (4) Trash was left under the beds and it was just not clean at all. I have plenty of pictures of the place before after we arrived - and how we left he place. I can guarantee you that we left the waaay cleaner then when we first arrived. (5) The owner texted me and stated we would receive cash back plus our deposit. I received the initial deposit back on 9/25 (3 weeks after I got back home and I had to ask for it!) I sent her a text on 9/25 asking about the additional amount- I am still waiting for it. (6) Watch out for the wooden chair! It is broken and should not be sat on. Finally, whomever rents condo after us - we left you coffee, filters, trash bags, toilet paper, cleaning supplies (new broom and mop). We washed all the sheets, bedspreads, and all the towels. By the way, if you have 10 people in the condo make sure you bring more towels and wash cloths. There are only enough there for 8 people! I regret to say we have to agree. We had discovered after your stay (and 2 others) that a renter had brought a pet for their stay. We do not allow pets for the reasons you mention here. The other items - we called our maintenance dept when you let us know. We were unable to get anyone out there to fix so that's why we offered to refund the extra $100 for your inconvenience. As to why there was not a broom and mop I don't know. This was addressed with the cleaning service and handled when we found out. There are supposed to be 10 sets of towels in the unit at all times. It appears when you were there some had disappeared. Towels have a way of slipping off sometime. We are very sorry you had a bad week. I would recommend to you and ANYONE who rents through VRBO or any of the owner rental sites. PLEASE don't wait so long to do your review! Your stay was unpleasant in part because we had no idea of the problems until another guest left a review (again, many weeks after their stay. We have been renting condos since 1995 and for some reason we've really had a tough time this year. Shopping at Pier Park just 2 miles away. Fishing at pier just 2 miles. Hombre golf course 4 miles. LOTS of GREAT seafood everywhere! Frank Brown park less than 2 miles. Cleaning fee waived (reflected in discount) on weekly rental! Monthly Rates available upon request for winter. Rates may vary for special events. Weekly minimum spring and summer. Saturday to Saturday.